Ski South America for a great vacation – fantástico y excelente! South America is not just famous amongst international travellers for Latin salsa dancing, Machu Picchu and scantily clad Brazilian beach-goers. There is also some great skiing to be found, especially in the Andes of Argentina and Chile. Skiing in South America is world renowned, but it is particularly popular amongst keen skiers and boarders from the USA and Canada who need a ski fix during the Northern hemisphere summer. 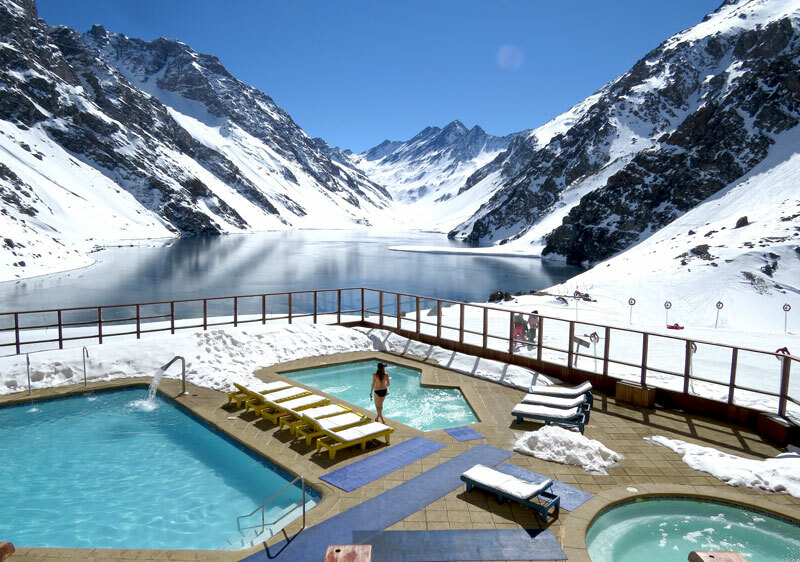 South America features more than 30 ski resorts. Most of the skiing in South America is in the gargantuan Andes mountain range that creates a natural border between Argentina and Chile. In addition to the Chile ski resorts and Argentina ski resorts, the Andes also provide an endless expanse of backcountry ski terrain. There is also a ski resort in Bolivia, Chacaltava, which claims to have the highest elevation lift served skiing in the world, but it’s rustic with a capital “R”. Skiing and boarding elsewhere in South America is limited to guided ski touring in Columbia, Ecuador and Peru. Some well known Argentina ski resorts are Las Leñas, Cerro Catedral (Bariloche), Chapelco and Cerro Bayo. High profile Chile ski resorts include Portillo, Valle Nevado, La Parva, El Colorado / Farellones and Nevados de Chillan (formerly known as Termas de Chillan). The ski resorts have extreme diversity regarding the infrastructure, cost, and clientele that visit them. Some resorts are incredibly rustic, designed for family fun, and the peso reigns supreme. There are many resorts at the other end of the spectrum where there are multi-million dollar lift systems, swanky hotels, and the US dollar is the main currency. The Andes Mountain range that splits Chile and Argentina is the second highest mountain range outside the Himalayas. Consequently many of the ski resorts are at high altitude with lift-served elevations reaching up to 3,700 metres (12,140 feet). At these dizzying heights, you’ll need to take it easy for the first few days, but these altitudes also bring advantages for the snow enthusiast. The snow fall is reliable, and the quality of it is reasonably well retained. Andean snow is typically a cross between the coastal snow packs you’d find on the west coast of North America, and the dry powder found in Utah and Colorado. In the south some of the ski resorts have a mix of skiing above and below the tree line, but many of the South American ski resorts are above the tree line. Great views are afforded at these heights, and some people prefer to ski in open terrain. However treeless terrain can have many disadvantages. In inclement weather there are no sheltered areas on the mountain, and resorts sometimes have to close or at least put some of the lifts on wind-hold. And if the resort remains open, the impaired visibility may turn a ski pro into a novice. Thankfully there are plenty of sunny days in South America. See our South American ski resort comparison to compare snowfall, size, mix of terrain, size, elevation and ski vertical. Various resorts in South America offer heli skiing, and the majority of them provide single day packages. Some of the heli-ski operators also offer single runs, so there is the convenience of being able to mix and match resort skiing with heli skiing. The proximity of the heli ski operators to the resorts is particularly advantageous for families or groups where only one member of the group wants to go heli skiing. See our Chile heli skiing page for more information. Needless to say, the South America ski season is during the southern hemisphere winter. The ski season begins in mid-June and runs to October, and backcountry touring can extend another month beyond this. For prime powder skiing in South America, your best bet is mid July to early September. Why Ski or Snowboard in South America? South America offers a diversity of ski terrain and powder skiing on a huge mountain range. However, a ski vacation to South America isn’t just about the skiing and snowboarding. If you love to combine great skiing with an amazing nightlife, then South America is for you because you get to experience the fabulous Latin culture. Après starts late, dinner is later, and dancing is much, much later. You might not make the first lifts the next day, and avid powderhounds will love you for staying in bed all morning, especially on powder days. A great way to explore the South American ski resorts is to go on a multi-resort tour, and some itineraries also incorporate snowcat skiing or backcountry touring. Apart from meeting other like-minded riders, there are multiple benefits of going on a tour. You won’t have to struggle with your Spanglish language skills, and the guides also look after all your transport requirements. Some tours also incorporate other activities such as winery visits, Mapuche village outings, or other cultural experiences. You can also get the most out of the ski areas because the guides know the terrain intimately so you get to ski the best lines in the best snow with your safety being paramount. You don't need to be an expert or advanced rider as there are many intermediate trips available, and some tours incorporate instruction or coaching. See the Chile ski tours and the Argentina tours pages for more information. For tour dates and an indication of availability, check out the South America ski tours schedule page. Price p/p From price based on adult rate, twin/double-share room occupancy. Price p/p "From price" based on Lodge Ingenio, twin/double-share room, group of 8, 7 nights, 3 days heliskiing package. Price p/p From price based on twin/double-share room (group of 2) staying at Inca Hotel. Min 2 guests required to tour to operate. Price p/p From price based on twin/double-share room (group of 2) staying at Inca Hotel. Price p/p "From price" based on twin-share Patagonia heliski week.